Finding Kat Heckenbach: More good news!! I got TWO emails today telling me I will have a total of three stories coming out soon. These are personal experience stories. One will be in the online magazine "Now What?" on December 31st. I'll post the link when it comes out. The other two will be in an anthology by HCI Books, The Ultimate Christian Living. The book comes out in March 2010. I'm super excited about this! I've been feeling kinda dumpy because of lack of interest in my novel, and lack of time to work on my writing lately. It is reaffirming to get acceptances on my previous works. I feel much more motivated to get going again after Christmas! Look at this, Kat! What an affirmation! What a Christmas present! What an answer to prayer! 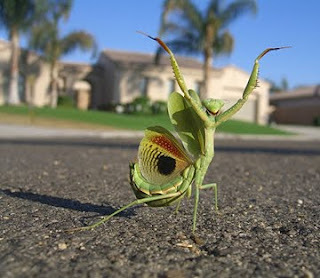 This insect here is doin the happy dance, forsure! Congratulations! Haha, I love the picture; so funny. Yes! Good news Kat. Congratulations! I can't get bugs to dance for me. You MUST be very special!